· Two goods are produced depicting choices and trade-offs for a nation. · Full employment and Full production are achieved allowing for maximum utilization of resources. · Short-run is the time frame over which resources cannot be improved or increased. 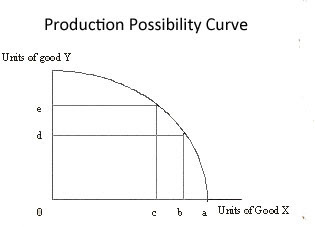 · The bow Shaped Curve is a number of Maximum combinations of product X and product Y that this hypothetical economy can produce in the short run. · More X can be produced only with the sacrifice of good Y. · The movement from a to b means less of good X produced. This will free up resources to produce more of good Y. · Notice that the movement from a to b on the X axis allows a movement from d to e on the Y axis. Both are maximum combinations but a choice must be made. · Notice that on the X axis, the distance from a to b and from b to c are essentially the same. · Notice that on the Y axis, the distance from 0 to d and from d to e are not the same. On the other hand, nations cannot produce a combination of X and Y that lies outside the curve. This is impossible in the short run due to some fixed resources such as land or capital. · The first sacrifice of resources to X ( a to b ) Yielded a large gain in production of Y. The second sacrifice of resources to X, ( b to c ) yielded a significantly smaller increase in the production of Y.
of course, three types of relationship within the production function (y = f(x1, x2, x3....., xn) is most important. 1- In the case of "production possibility", there is a Product___ product relationship, which responds to basic and core economic question (what to produce). Here the producer is ready to trade off between the products (eg. y1, y2). 2- factor _________ product relationship, which respond to the question (how much to produce? ), and the related function is look like y = f (x1|, *x2, x3, .....xn). 3- factor ______ factor relationship, find the solution to the problem producers are facing that (How to produce?). He makes the trade-off between two factor of production, here the technical terms are isoquant or resource technical substitution, isocost (which aims in cost minimization/or least cost combination).